The Orion Capital Management acquisition brings Illinois-based Savants total AUM to nearly $4.5 billion, and CEO Brent Brodeski says another deal is "in the works." 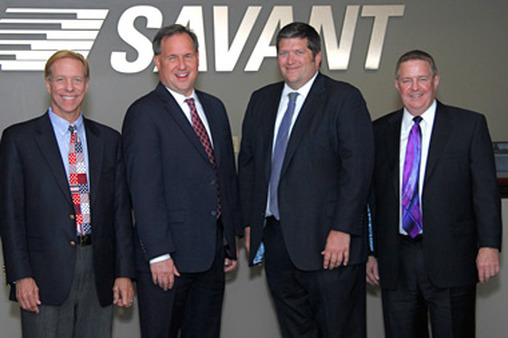 Savant Capital's principals pose following Savant's merger with The Monitor Group in 2012. Savant Capital Management has closed on its third acquisition of a fellow RIA firm over the past 17 months with the purchase of Orion Capital Management of Winnetka, Illinois. Brodeski declined to provide specific financials around the acquisition, but similar to Savant’s other deals, there was a cash payment to Orion’s owner, James Kyle, based on a multiple of Orion’s EBITDA, along with a note and an earnout period. Kyle also received “some units of Savant LLC” so “he has skin in the game,” Brodeski reported. “The economics are favorable to Jim,” he said, and there are “significant incentives” to grow Orion’s business post-acquisition. While that’s a similar structure to other RIA acquisitions, Brodeski points out that the key to the deal was to “lock in the next generation of advisors,” so that two younger advisors at Orion, Michael Denten and Steve Cummings, “bought into Savant” as part of the acquisition. Orion was attractive to Savant, despite it being “very picky” about the acquisitions it makes, because the two firms were “culturally aligned” and shared “a common vision,” Brodeski said. Before Orion, Savant’s most recent acquisitions were of Naperville, Illinois-based Paragon Advisors, also an $150 million AUM firm, in January 2014, and Green, Plagge and Shaw, a St. Charles, Illinois-based tax and accounting firm. Brodeski and Savant have written a free white paper on succession planning available on Savant’s website.